Taking leave of my publisher, I went to consult an artist friend on my future prospects. This is an 1856 novella written by Wilkie Collins and published serially. 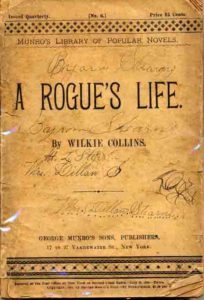 The novel spends several years with Frank Softly, the titular rogue and someone from a middle-class, more or less well-to-do family, who goes from being a political cartoonist to a would-be artist to a would-be scam artist plying his artistic trade in numerous ways including producing fakes of masterpieces and counterfeiting money. This book is relatively short and you can feel within the writing that it’s being serialized because chapters to tend to wrap up more than simply end. There’s also a more or less steady flow of references to the next series or next installment. This in part makes it a little goofy, because it has that element of someone aware of being in a story, but it’s also interesting, because it has that element of someone aware of being in a story. There’s a pretty hefty nod at the beginning in the author’s prefaces and dedication to the influence of Charles Dickens. Collins was significantly younger than Dickens and looked up to him as a mentor and a friend. So the connections between the two writers exist within and without Collins’s works. I’ve only ever read one more of Collins’s books, The Moonstone, which I did like a lot. It’s very different from this one. That one involved multiple narrative voices, some really interesting looping techniques in the story, and the sussing out of the detective genre, and I highly recommend it. This book is much more straightforward in its story and character. It’s clearly the writing of someone still working out his style and voice. The book did put me into the context of the time period in some interesting ways. Printing had obviously been around for a long time, but I have to imagine counterfeiting had a much more real and interesting danger to it when there were much fewer opportunities for checking on them and almost no safeguards. In addition, how would ANYONE in any real way know if a painting were real or fake, given the technologies we use now to check. I ended up reading this book when I happened to see it at the library. I am going to be reading The Woman in White at some point in the near future and was just kind of inspired but what little I knew of this one, plus the length (a loose 150 pages) was appealing too. Share the post "Taking leave of my publisher, I went to consult an artist friend on my future prospects."